"A private team is priming a 36-year-old NASA spacecraft to perform new science as it travels through interplanetary space after attempts to move the probe into a position closer to Earth failed. The volunteer team initially hoped to park the vintage International Sun-Earth Explorer 3 spacecraft, called ISEE-3 for short, in a stable location between the Earth and the sun called L-1. But those attempts ended when controllers discovered there wasn't enough nitrogen pressurant left in the probe's tanks to help make course corrections." Vintage NASA Spacecraft to Tackle Interplanetary Science, Space.com\n\n\"A private team is priming a 36-year-old NASA spacecraft to perform new science as it travels through interplanetary space after attempts to move the probe into a position closer to Earth failed. 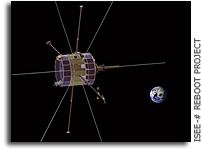 The volunteer team initially hoped to park the vintage International Sun-Earth Explorer 3 spacecraft, called ISEE-3 for short, in a stable location between the Earth and the sun called L-1. But those attempts ended when controllers discovered there wasn't enough nitrogen pressurant left in the probe's tanks to help make course corrections.\"